Led by self-identified Republicans, Texans favor bans on Syrian refugees, blocking travel from certain countries and outlawing "sanctuary" cities, according to the new University of Texas/Texas Tribune Poll. A majority of Texans support banning Syrian refugees and blocking individuals from seven countries from entering the United States, according to the latest University of Texas/Texas Tribune Poll. 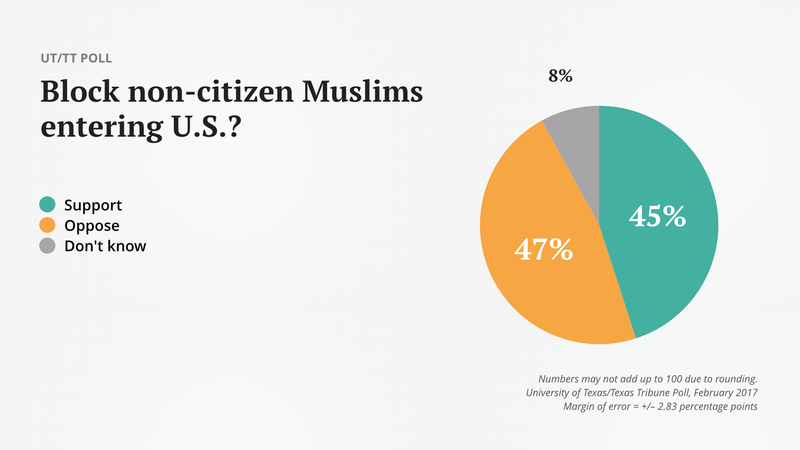 They balk, but only a bit, at banning Muslims who are not U.S. citizens from entering the country, the poll found. Asked about banning Syrian refugees, 54 percent they support that policy — 37 percent of them “strongly” so. Republicans are with President Trump on the issue: 65 percent strongly support a ban, and another 17 percent “somewhat” support a ban. Democrats are on the other side, with 51 percent “strongly” opposing the ban and 18 percent “somewhat” opposing it. White Texans support a ban (63 percent), while a plurality of black (49 percent) and a slight majority of Hispanic Texans (51 percent) oppose one. The responses were similar to a question about blocking entry of people traveling from Iran, Iraq, Libya, Somalia, Sudan, Syria and Yemen — the seven countries listed in an executive order from President Trump. 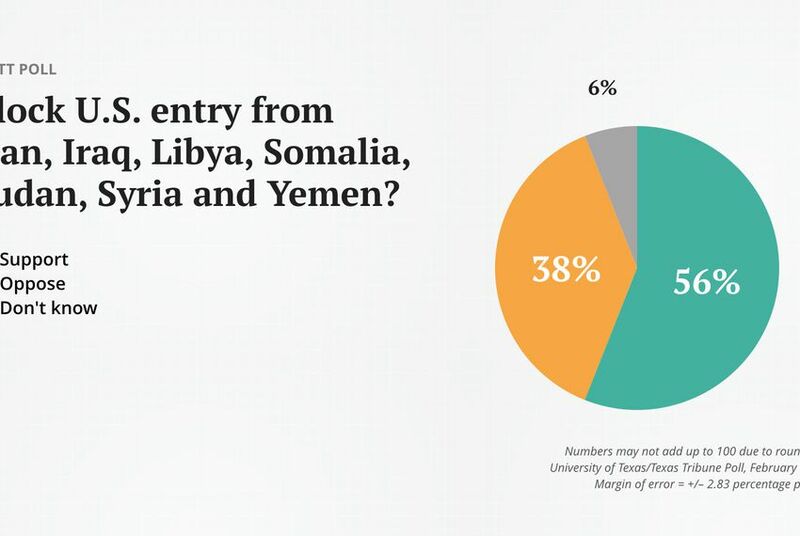 Overall, 56 percent support temporarily blocking entry from those countries while 38 percent oppose it. Again, there’s a partisan split, with 88 percent of Republicans in favor and 71 percent of Democrats opposed to blocking travel. “I’m used to talking about how Texans are more open about this stuff, but these are more conservative than the national numbers,” said poll co-director Daron Shaw, a professor of government at the University of Texas at Austin. Republicans said they would support banning Muslims who are not U.S. citizens from entering the U.S., with 51 percent strongly in support and another 16 percent somewhat in support. But the overall numbers for a religious ban were mixed, with 45 percent in favor and 47 percent opposed. Among Democrats, only 19 percent support a ban, while 56 were strongly opposed and another 16 percent were somewhat opposed. “The administration has claimed that this is not a Muslim ban, and you can see the social undesirability of it in the answer here,” said Jim Henson, co-director of the poll and head of the Texas Politics Project at UT-Austin. Half of Texans oppose “sanctuary” cities, where local police and city government employees don’t automatically enforce immigration laws by turning undocumented immigrants over to federal authorities. Only 37 percent support that practice. 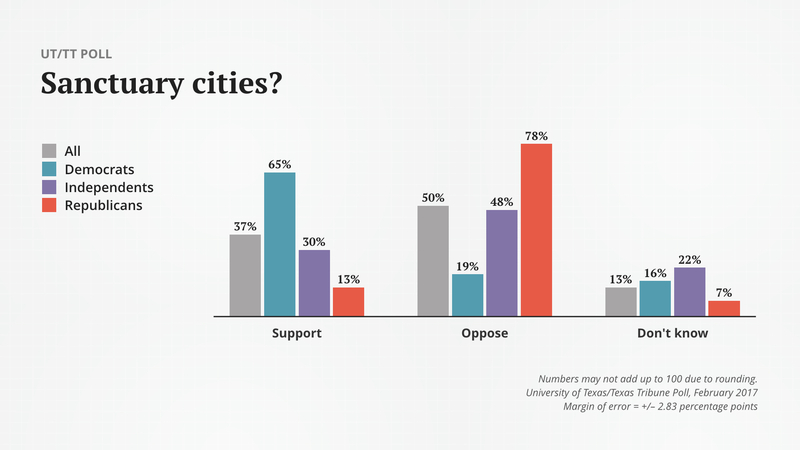 Republicans in state government are pushing hard for a ban on sanctuary cities, and their voters appear to be solidly behind them: 71 percent “strongly oppose” sanctuary cities and another 8 percent “somewhat oppose” them. Democrats support them, but not as intensely: 41 percent strongly support sanctuary cities and 24 percent somewhat support them. A narrow majority of Hispanics — 53 percent — are with the sanctuary cities. Among white Texans, 30 percent are with them and 61 percent are against; 41 percent of black Texans are with the cities and 29 percent are against. A plurality of Texans — 47 percent — would continue to extend in-state tuition at state colleges and universities to undocumented immigrants who graduated from Texas high schools, have lived in the state for three years or more and have applied for U.S. citizenship. More than a third — 36 percent — would have those students pay higher out-of-state tuition rates. As in so many responses in the current poll, the party flags were flying in these answers: 66 percent of Democrats said the students should pay in-state tuition, and 57 percent of Republicans said they should pay out-of-state tuition. Among Tea Party Republicans, 68 percent said out-of-state tuition should apply. Even so, Texas politicians have been more forgiving on this issue than their counterparts in other states, and they have suffered for that in national elections. “[National politicians] wonder why Rick Perry and others had this albatross around their necks, but they were reflecting Texas attitudes,” Shaw said.